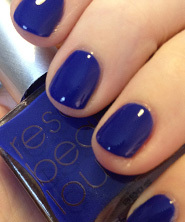 Have you tried using something around your cuticles like aquaphor so the polish doesn’t stick? I found it helps alot with cleanup when I am doing sponging. I like the gradient color sponging very cool. I agree it did look better with out the stamping. Oh and I Prefer your other camera angle. Thanks again for sharing another great video with all of us. thank you! I had never actually *seen* this method, now I understand it so much better :D (and I can share it with friends). But I do kinda prefer your previous angle for videos. The new angle is a nice change! I like the white under your hands better tooo! 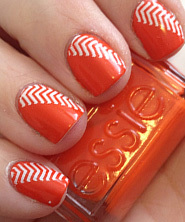 Great idea for the nails! i think your other camera angle was much better. and have you considered getting a cheap brush to clean up the polish around the cuticles instead of cotton swabs? i think a brush works a lot better. Love this! 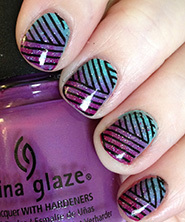 Thanks for sharing how to do the gradient polish. I have been wondering how ppl do this. 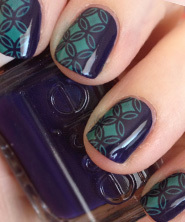 Love the colour combination of the gradient stamping and agree that (in this case) it looked better without the stamping. Liked the previous camera angle better – but then I watch you card videos so have kind of got used to it! Thanks for sharing! Thanks for showing this sponge technique. I had heard of it but had not seen a demo. I like the other camera angle better. Beauty and paper craft is a good combination. You inspired me to go crazy on my toes. I’m wearing a yellowie-gold glitter. Thanks for new ideas. So cool I am learning so much from you. I think this camera angle is great but I like previous one as well. I think it depends on what you’re trying to show. I thing the angle of this video really made it easy to see how the sponge is positioned when it makes contact with your nail. So, I wouldn’t mind if you mixed it up. Overall, I have always loved painting my nails and have been really enjoying all the things you’ve been doing!! I prefer the overhead shot. Your tutorials are wonderful. Thanks. I don’t mind this camera angle at all. I’m used to the overhead angle from your card videos, but you probably don’t have to flip everything from this angle. You just keep on doin what you do, and we’ll continue to swoon over it from any angle. I hadn’t seen the combination scraper/stamper before. I have the separate pieces, but that looks like it helps you go a little faster. I may just have to buy that one. Thanks! I love the combination tool! Where did you get that one?